In 2017, the cumulative daily melt area for the Greenland ice sheet was the smallest since 1996, yet still higher than any year between 1979 and 1994 (1995 was a high melt season). The 2017 melt season was also notable for its late melt events, one of them occurring on October 29 to 31, tied for the latest for any year in the satellite record. We have re-started daily monitoring for 2018 and will be providing periodic discussions as conditions warrant. Early melting in 2018 has been confined to a few points along the eastern coast. Figure 1. The top map shows the cumulative melt days for the 2017 melt season (upper left) and the departure from the 1981-to-2010 average melt days (upper right). A time series of daily melt area as a percentage of the ice sheet extent for the entire season is shown in the bottom panel. Figure 2. The top chart shows the total melt area for the annual melt season (April through October) over 39 years of the passive microwave satellite record. Units are tens of millions of square kilometers. The mean for the 1981 to 2010 average of 18.4 million square kilometers (7.143 million square kilometers) is shown as a red line. The bottom chart shows the cumulative melt area (the running sum of the daily area experiencing melt) in millions of square kilometers for the three most recent melt seasons: 2015, 2016, and 2017. The 2017 melt season was less intense than recent years, and was below average melt in the 1981 to 2010 reference period. 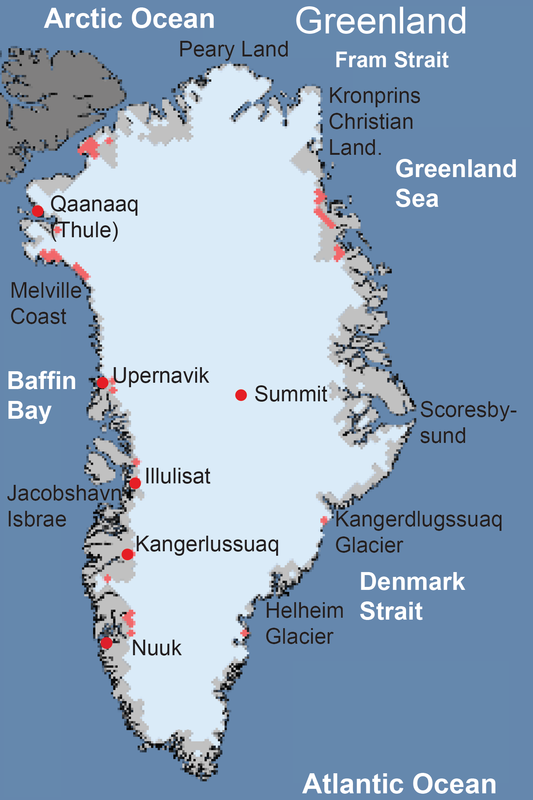 Surface melting was particularly low in southeastern Greenland. In general, melting was limited to low elevations (below 1500 meters or 4900 feet) along the western and northeastern coastlines. Fewer melt days than average occurred along the Davis Strait and the interior melt pond region along the central western coast. 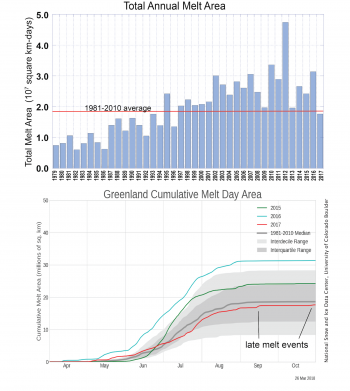 As discussed below, the melt year ended with two significant late melt events in southeastern Greenland. The final 2017 melt event occurred at the end of October, covering the southeastern coast. Overall, the 2017 melt season was the lowest since 1996. Although it began and ended with a few large melt events, the middle of the melt season through mid-July was below average—only briefly picking up intensity late in July through mid-August. Figure 3. Air pressure differences (top) and air temperature differences (bottom) are shown at the 700-millibar pressure level in the atmosphere (approximately 10,000 feet above mean sea level), relative to the 1981 to 2010 reference period for June, July, and August 2017. 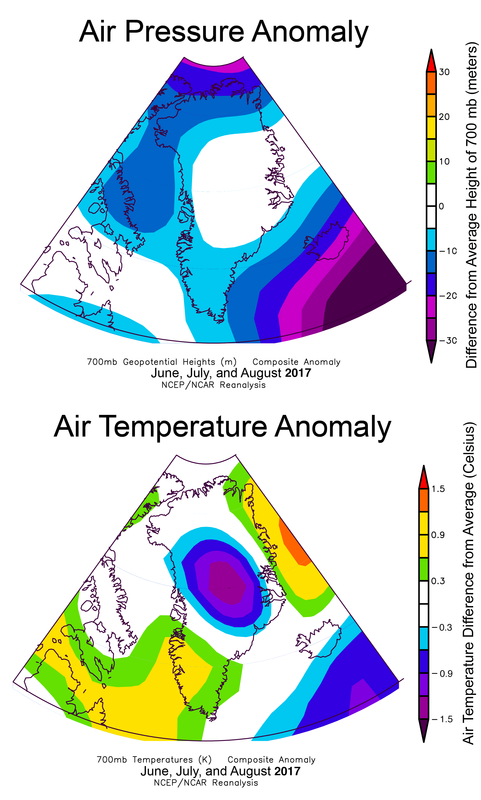 Lower-than average atmospheric pressure southeast and north of Greenland was present during the height of the summer melt season. 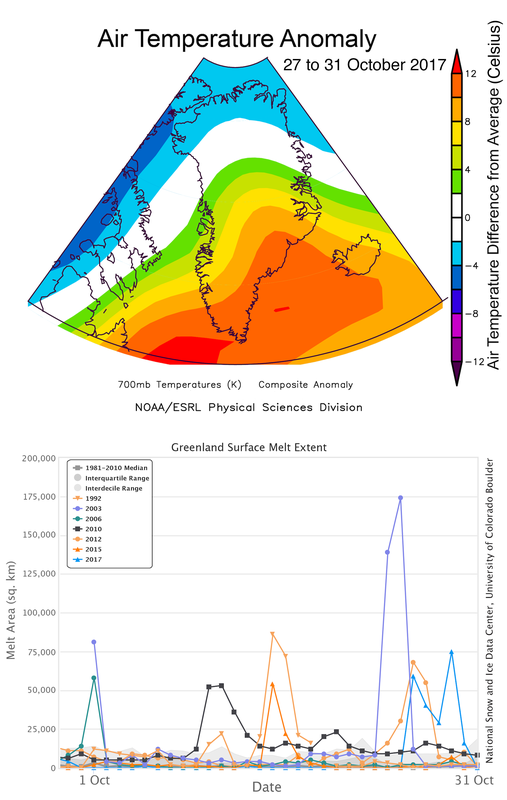 Near the summit in central Greenland, the average air temperature for the summer melt season was more than 1 degree Celsius below the 1981 to 2010 average. Temperatures were about 1 degree Celsius (2 degrees Fahrenheit) above average along the southwestern tip and northeastern coastline. Figure 4. The top image shows the temperature departure from average at the 700-millibar level (approximately 10,000 feet above sea level) from October 27 to 31, 2017, relative to the 1981 to 2010 reference period. 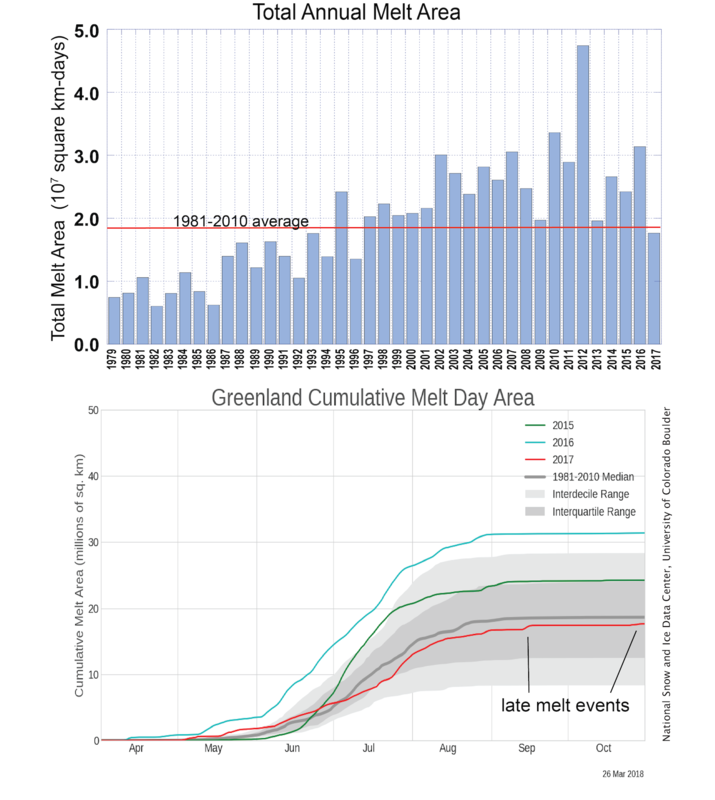 The bottom graph shows Greenland daily melt area for all years with October melt events exceeding 50,000 square kilometers (19,305 square miles). The 2017 melt year ended with two extreme spikes in melt area, one in mid-September and one at the end of October. While not unprecedented, such events are unusual. The 2017 late October event was notable for its duration (4 days with melt area above 25,000 square kilometers (10,000 square miles)). As with many warm events during the winter, a surge of warm air along the eastern coast was responsible for the melting. In 2003, a much larger melt event occurred in late October. 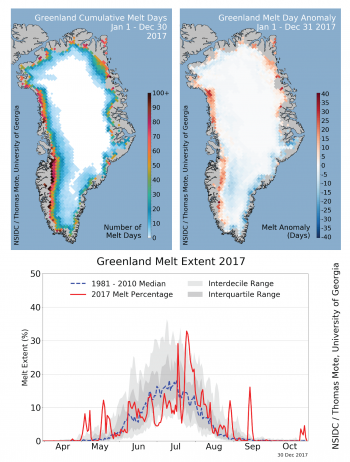 Did the Greenland ice sheet grow in 2016 to 2017? Figure 5. The top graph shows daily net snow-rain-melt changes in mass for the Greenland ice sheet (in gigatons/day) for the 2016 to 2017 season and the 2017 to 2018 season to date. The grey band and dark grey line show the 1981 to 2010 range. 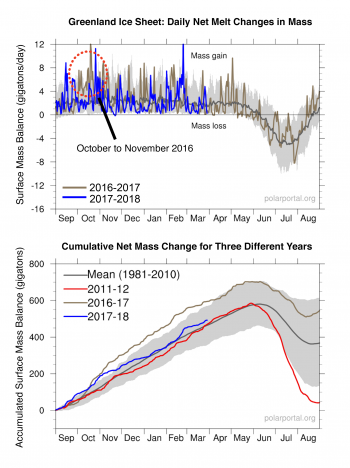 A large and prolonged addition of mass occurred in October to November 2016. A similar, but briefer mass increase is seen for mid-February 2018. The bottom graph shows cumulative net mass change for three melt years: 2011 t0 2012, 2016 to 2017, and 2017 to 2018 to date. Figure 6. This graph shows Greenland’s total mass balance from snowfall, rainfall, and melt runoff (surface mass balance or SMB) during the melt year (September to August) for all 39 years in the passive microwave satellite record. A model-based assessment of Greenland’s total net mass balance from snowfall, rainfall, and melt runoff (surface mass balance or SMB) shows large snow input in fall and winter 2016, followed by low surface melting in summer 2017. Relative to the 1981 to 2010 reference period, the ice sheet accumulated just under 200 billion tons more snow than typical. This value does not include the mass lost through ice flow to the ocean that produces icebergs, or to melting on the underside of the ice as it first flows into the ocean. Compared with 2014 to 2015 and 2016 to 2017 melt years, where mass loss ranged between -190 and -270 billion tons, it is likely that 2016 to 2017 was very close to a zero net mass gain, and possibly positive. 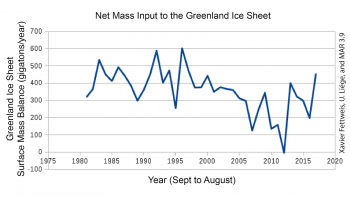 If so this would be the first time since the late 1990s that the ice sheet increased in size. Unfortunately, the best satellite for making such assessments, the Gravity Recovery and Climate Experiment (GRACE), ceased to operate prior to summer 2017. The replacement satellite, GRACE-Follow-On (GRACE-FO), is scheduled to launch this spring. Early trends in the 2017 to 2018 season show a smaller but still above-average snowfall input to the season so far, with an intense storm depositing a significant amount of snow in mid-February. Early melt events prior to April 1, have been minor, but a few areas of melting occurred on February 18, along the eastern coastline. The eastern coastline is also the main region of above-average snow input to date.